Internet. What is it for? I was trying to make a point yesterday about the correlation between snow levels and internet banking usage. As many of you correctly pointed out, the fact the Northern Europeans love to bank online has more to do with the availability of internet than with 3 meters of snow outside. 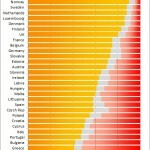 And sure, there are differences in internet availability between the EU countries. But I guess it has even more to do with the willingness of people to use the internet as such. In Norway, 90% of inhabitants use the internet every week. And only 5% say they have never used it. I have to admit, before I downloaded these stats from Eurostat, I would have said that pretty much everybody has done something with the internet at least once in their life. But that’s not quite so. Take Italy for example. 40% of Italians say they don’t use the internet at all. That is in my view an unexpectedly high number. In Greece, this figure is over 50%. And mind you, this statistic includes any internet usage regardless of the type of connection. The chart also shows that internet use is quite addictive (click twice to enlarge). People either use it every week or not at all. The group of people who use the internet less than once a week is quite tiny just about everywhere – snow or no snow.